Rose Community Foundation is committed to helping families engage in thoughtful, multigenerational philanthropy. 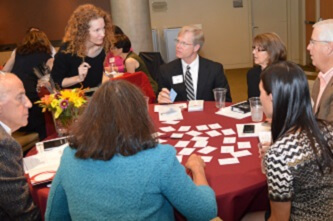 To help further our work in this area, we brought in a national expert on next generation and multigenerational philanthropy, Sharna Goldseker (standing in photo above), to train our board, professional advisors and staff in October. Goldseker is executive director of 21/64, a nonprofit consulting practice. Giving together as a family is a terrific opportunity to share something special. For many families, it also provides an opportunity to bring multiple generations together, whether through a family foundation, donor-advised fund or annual giving. Helping multiple generations engage in philanthropy together is a growing area of expertise for Rose Community Foundation. We often help families navigate their philanthropic journey, especially during times of transition such as starting a new family fund or engaging the next generation in an existing family fund or foundation. “Regardless of your family’s unique situation or how much money you have to give, taking the time to be intentional will help ensure a rewarding experience for everyone in the family,” says Anita Wesley, philanthropy advisor at Rose Community Foundation. Start by considering the purpose of your philanthropy. For example, is it important to pass the family’s legacy, traditions and values on to younger generations? Or do you want to encourage future generations to discover and develop their own philanthropic values? Next, take some time for each family member to share what they care about. What values motivate you to give back? What causes resonate with you? You may be surprised at the values you share in common with other family members, even if you interpret or express them in different ways. Finally, your purpose and values will help define your approach. For example, if you’re focused on instilling legacy, your family might visit organizations that older generations have supported to better understand why the causes are important. If you’re looking to help younger generations develop their own philanthropic preferences, you might encourage family members to present their personal ideas and recommendations of nonprofits or causes to support. Regardless of how or where your family philanthropy conversations take place, the resulting decisions will help guide your family giving and the common threads will help connect one another in unique and meaningful ways.